If food reflects our culture or who we are, then Nova Scotia Cookery, Then & Now, Modern Interpretations of Heritage Recipes, Presented by the Nova Scotia Archives and Select Nova Scotia, is both a reflection of who we are and, more importantly, who we were. Specifically, how we ate to maintain life between the late 18th century and mid-20th century. Food writer, Valerie Mansour – with archives staff – has curated over 80 fascinating recipes covering almost 200 years of Nova Scotia life. Many were recorded insufficiently and required interpretation and redevelopment. This job fell to 25 chefs and food and beverage experts throughout the province – all associated with Taste of Nova Scotia. Mansour’s goal was to modernize or make the recipes relevant in the 21st century, without sacrificing their historic integrity. She did it, beginning with the first recipe, where Andrew Prince of Halifax’s Ace Burger Co. took an ingredient list – that’s all there was – for a 1786 dessert, Irish Potato Pudding, and turned it into Potato Crème Brûlée. One small, delicious addition, a few tablespoons of Nova Scotia ice wine, along with the use of modern cooking techniques, achieved a fine result, while maintaining the essence of a 231-year-old recipe. Today’s cooks favour cookbooks with plenty of photographs, the more eye dazzling the better. 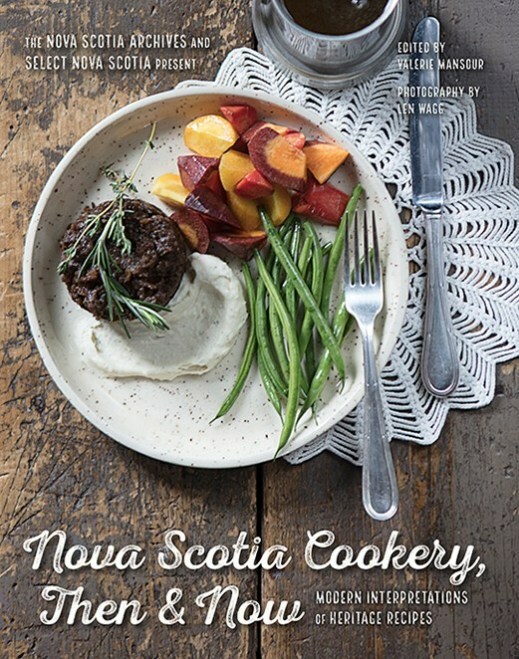 Nova Scotia Cookery, Then & Now features many remarkable photos taken by photographer, Len Wagg, of food styled by Jessica Emin. The historic nature of the dishes is suggested by backgrounds using antique tables, flatware, dishes and vintage accessories, like old fashioned lace doilies. Viewing Wagg’s pictures is like seeing the past in high definition. Nova Scotia Cookery, Then and Now would make an excellent addition to any cookbook collection, both for its appetizing recipes and its valuable record of how we nourished ourselves throughout history.